Surprise! 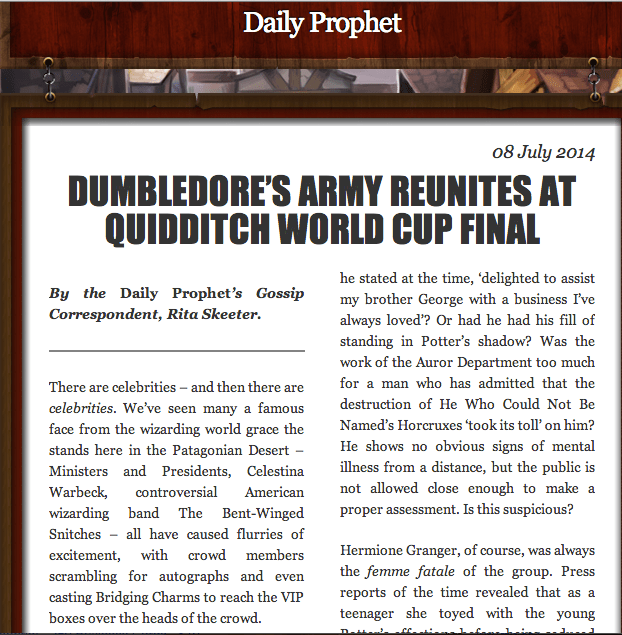 If you’ve been following Pottermore (and let’s face it, not many of us have been…), then you know that back in April, the site started producing Daily Prophet articles with updates of the Quidditch World Cup written by Quidditch Correspondent in the Patagonian desert, Ginny Potter. I read somewhere that the articles are timed to coincide with FIFA World Cup fever, but who knows? Regardless, you have to be logged into Pottermore to read them, including a special gossip column that came out yesterday from none other than Rita Skeeter. Harry is 34 and still wears his signature glasses. Harry is an Auror now. Ginny is a sports reporter. Ron left his job as an Auror after only two years to co-manage Weasleys’ Wizard Wheezes alongside George. Hermione is Deputy Head of the Department of Magical Law Enforcement. Percy is Head of the Department of Magical Transportation. Charlie remains both a dragon wrangler and unmarried. Teddy Lupin is described as a “wild child” in need of an intervention and spends all day “snogging” with Victoire Weasley (daughter of Bill and Fleur). The “It’s going to be gone soon” Harry Potter Movie Post.